Author: Michael Broß, Ahmad Tela Baba. With drawings by: A.T. Sati. Series edited by: Herrmann Jungraithmayr, Norbert Cyffer. 18 pp. Roman, 275 pp. 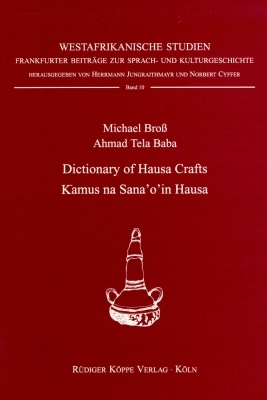 The present dictionary represents a collection of today’s common craft terminologies of the Hausa in Northern Nigeria. It contains terms for craft products, materials and manufacturing processes that were collected by the authors during 1989 and 1994 in rural areas of the Hausa provinces of Bauchi, Daura, Guddiri, Hadeja, Kano, Katsina, Kebbi, Sokoto, Zamfara and Zaria. The entries are illustrated by numerous sketches, drawings and photos by A.T. Sati. This dictionary has two merits: the first one to offer a large documentation on (ten) Nigerian Hausa dialects in the field of crafts, the second one to have preserved some aspects of Hausa culture. The work is well done on the linguistic point of view, because every word is given in a scientific transcription (i.e. the authors mark tones, vowel length, and even the flapped and rolled r). Another positive aspect of the work is represented by the indication, through some initials, in which field (i.e. carving, sewing, tanning, etc.) the word is in use. [...] The judgment on this dictionary is so positive to wish that the authors could produce, as affirmed (p.xii), a second volume containing the Hausa spoken in Niger and the diaspora and a cheap edition for Hausa market.